Monarch was George III. Prime Minister was Lord Liverpool (Tory). "Uncle Sam" was first used to refer to U.S. (in the Troy Post of New York). Americans under General Pike capture Toronto. British invade Plattsburgh, New York. Napoleonic Wars as Prussia declares war on France. Battle at Leipzig (Napoleon vs Prussia, Austria and Russia). Peninsular War, Battle of Vitoria when British, Spanish, and Portuguese forces under Wellington defeats a French force under Joseph Bonaparte. The British government removed the British East India Company’s monopoly of trade with India. 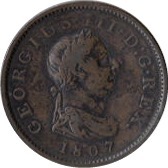 Last striking of Guinea coins, to pay Wellington's army in the Pyrenees. Jane Austen's Pride and Prejudice is published anonymously in London. 1813 can be written as MDCCCXIII. 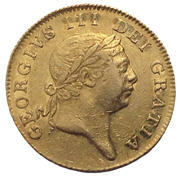 Do you want to buy or sell a 1813 Guinea? Selling to M J Hughes Coins means that you do not have to pay sellers fees, Paypal fees or any other transaction fees. They will give you an immediate offer and pay you the same day. Single coins or entire collection. 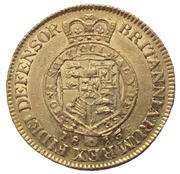 Buying from M J Hughes Coins gives you a money-back guarantee of authenticity. Visit http://mjhughescoins.com. THE2013 GUINEA ANNIVERSARY SILVER PROOF SET, PRESENTATION LIMIT 495, BOX, COA.